– Along with proving possession, the State needs to prove what the actual substance is. Possessing a green leafy substance or a white powder wont be enough for a conviction. – There is case law that says that a lab report is not necessary for a conviction. However, most Judges want a lab report, especially for a drug other than marijuana. 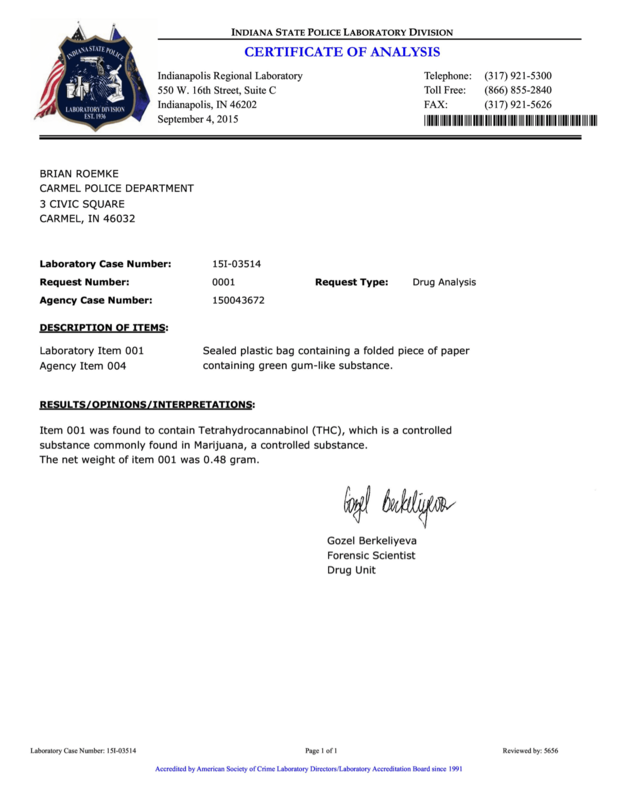 – When a lab report identifies the type of substance, the prosecutor will often ask (on the day of trial) whether or not the defense will stipulate to the admissibility of the lab report. In Marion County, defense attorneys started calling the crime lab on the day of trial and asking if they could speak with the particular lab tech. If the lab tech was available, the defense would stipulate to admissibility. If the lab tech was out, the defense would not stipulate to admissibility of the lab report. The State argued that the lab reports were business records and were admissible through another employee of the crime lab. The defense argued the admission of the lab reports without the testimony of the actual technician violated the right to confront and cross-examine. This issue eventually went to the court of appeals and the Court concluded that admitting a certified lab report without the testimony of the lab tech violated the right to confront and cross examine. See McMurrar v. State, 905 N.E.2d 527 (Ind.App. 2009). – Evidence was sufficient to convict defendant of possession of methamphetamine under IC 35-48-4-11 because: (1) testimony was presented by three officers that, based on their training and experience, the residue on a casino card and plate found in defendant’s residence was methamphetamine; (2) the officers found aluminum boats and hollowed out light bulbs containing burnt methamphetamine residue during a search; and (3) defendant admitted that he was an addict, that he used his own manufactured methamphetamine, and that he mostly manufactured methamphetamine for his own use. Boggs v. State, 928 N.E.2d 855 (Ind. Ct. App. 2010). – The Court held, “[T]he identity of a drug can be proven by circumstantial evidence. Clifton v. State, 499 N.E.2d 256, 258 (Ind. 1986). – “The opinion of someone sufficiently experienced with the drug may establish its identity, as may other circumstantial evidence,” but “chemical analysis is one way, and perhaps the best way, to establish the identity of a compound.” Vasquez v. State, 741 N.E.2d 1214, 1216-17 (Ind. 2001).